How to get to Lake Bled, Slovenia, from Italy, by train. | Where's Zoe now? How to get to Lake Bled, Slovenia, from Italy, by train. This is why you want to go to Bled. I was coming from Turin, so my first step was to get to Venice. It’s possible to get tickets for the Frecciabianca from Turin to Venice for 29 euro if booked in well advance. Last minute tickets are 56 euro. This is the only ticket worth booking in advance for this trip and it is the most expensive part of the whole venture. I got the 7:05 am train from Turin which was painfully early but I was excited about being on vacation so I probably couldn’t have slept late that morning anyway. I wish I could tell you what the scenery is like from this train but I have taken it 4 times now and always had bad weather. I arrived in Venezia Santa Lucia at 11:40 am, which gave me 24 minutes to duck outside and check the canal still exists and buy a slice of train station pizza before getting on the 12:04 pm train to Gorizia. This is a regional train, so the ticket costs 15 euro regardless of when you buy it. If you wanted a couple of hours in Venice you could instead take the 2:04 pm train. The weather was still bad for most of this leg so again, no scenery report. The tricksy part about this trip is that from Gorizia Centrale station, you have to get across town to Nova Gorica station which is actually on the Slovenian side of the border. Apparently back in the day when Italy claimed Gorizia as part of its territories, the Slovenians said “pffffff” and built Nova Gorica (“New Gorizia”) right next to it. These days, both countries are in the EU so the border doesn’t affect you as a traveller, and I got the impression the two town councils worked together on things like public transport and garbage collection. There is a bus that links the two stations (info in Italian on the “city international line”, tickets are 1 euro). I decided to walk instead since I’d been sitting on trains for 7 hours at that point, and have a quick coffee on the way. What I didn’t factor in was that it was Sunday lunch time in a small Italian city and I very nearly didn’t find anywhere open. Also, the sun came out and it was humid from all the rain before. In retrospect, I should have taken the bus. total cost: I paid 50.59 euro for transport. I think that counts as “cheap”. total time: left home before 7am, got to my accomodation after 5 pm. For sure this counts as “stubborn”. total train-nerd factor: it’s a scenic route I found out about it on seat61.com, it involves connecting regional trains that don’t even run in the same country, there’s nothing more to be said, really. would I do it again? Yes. Everything ran on time, the connections all worked out, it feels mildy adventurous but mostly involves sitting staring at scenery or reading a book. This entry was posted in Italy, Slovenia and tagged adventure, bled, budget, rail, train, travel on May 7, 2015 by Where's Zoe Now?. I did the Nova Gorica to Bled leg in 2012 and it was still only €6.22 then! I’d do it again definitely, the train was clean and almost deserted when I went. €6.22? Bargain! I went in August so the train wasn’t empty, but it certainly wasn’t crowded, either. Hey. Love the site Zoe, really impressive. 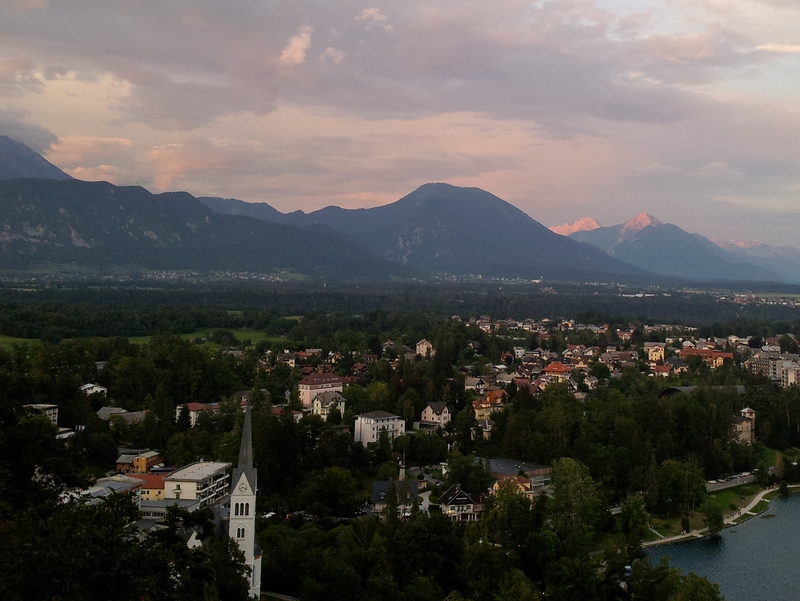 I’m off to Lake Bled in August for a few days, driving from Graz so really looking forward to that. It looks like a fairytale sort of place, almost unreal. Jonno.